Yvonne Cassidy honoured her late husband Sergeant Pat Cassidy’s wishes when he passed away at the age of 47, five years ago, by donating his organs and saving three lives. 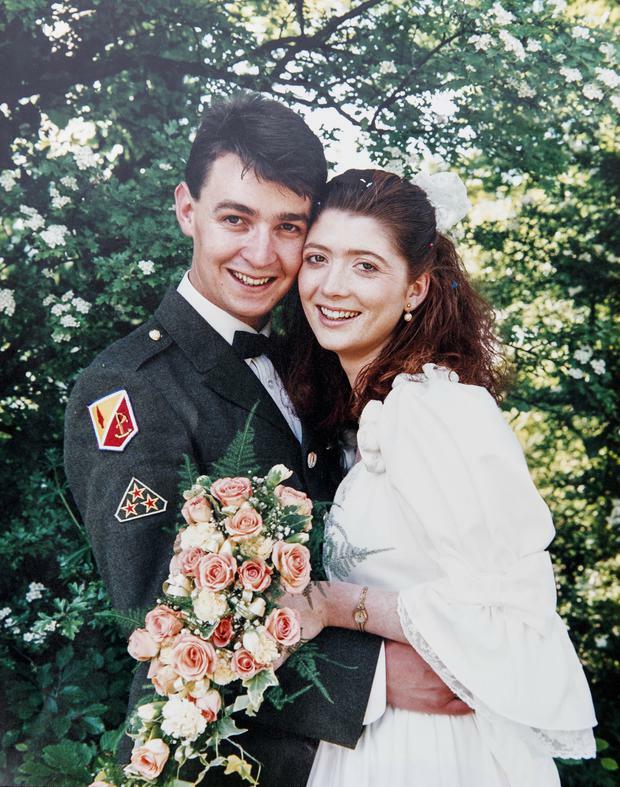 Pictured are the couple on their wedding day in McKee Barracks. 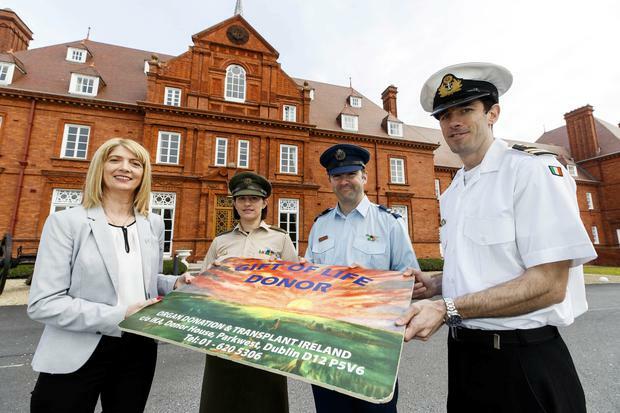 Repro Free: 01/04/2019 To demonstrate solidarity in support of Organ Donation, representatives of CAOGA in the Defence Forces – Army, Naval Service and Air Corps - stepped out at McKee Barracks along with the family of a deceased member of the Defence Forces. CAOGA organised the event in partnership with the Irish Kidney Association to mark the beginning of Organ Donor Awareness Week (30 March-6 April). Yvonne Cassidy honoured her late husband Sergeant Pat Cassidy’s wishes when he passed away at the age of 47, five years ago, by donating his organs and saving three lives. Pictured representing CAOGA and the Army was Comdt. Ciara Murray, Captain Andrew Fry from the Air Corps and Lieutenant Colm Fox from the Naval Service with the deceased donor Pat Cassidy’s wife Yvonne, her son Cian and daughter Jessica. 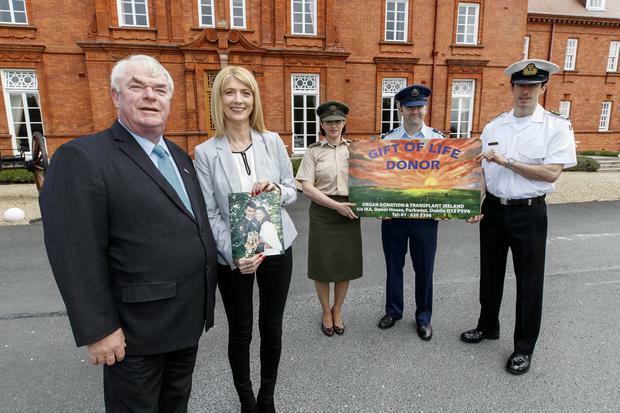 Members of the Defence Forces are showing their support for Organ Donor Awareness Week, while also remembering a young Army sergeant who helped save three lives after his organs were donated. The family of Sergeant Pat Cassidy - originally from Athlone - joined with Defence Force members earlier today in a special ceremony to highlight the importance of organ donation at McKee Barracks in Dublin. Repro Free: 01/04/2019 To demonstrate solidarity in support of Organ Donation, representatives of CAOGA in the Defence Forces – Army, Naval Service and Air Corps - stepped out at McKee Barracks along with the family of a deceased member of the Defence Forces. Yvonne Cassidy honoured her late husband Sergeant Pat Cassidy’s wishes when he passed away at the age of 47, five years ago, by donating his organs and saving three lives. Pictured is the deceased donor Pat Cassidy’s wife Yvonne. Sgt Cassidy was just 47 when he died following a heart attack - he was the holder of an organ donor card. His wife Yvonne and their children honoured his wishes, and his lungs, kidneys and liver helped save the lives of three people. 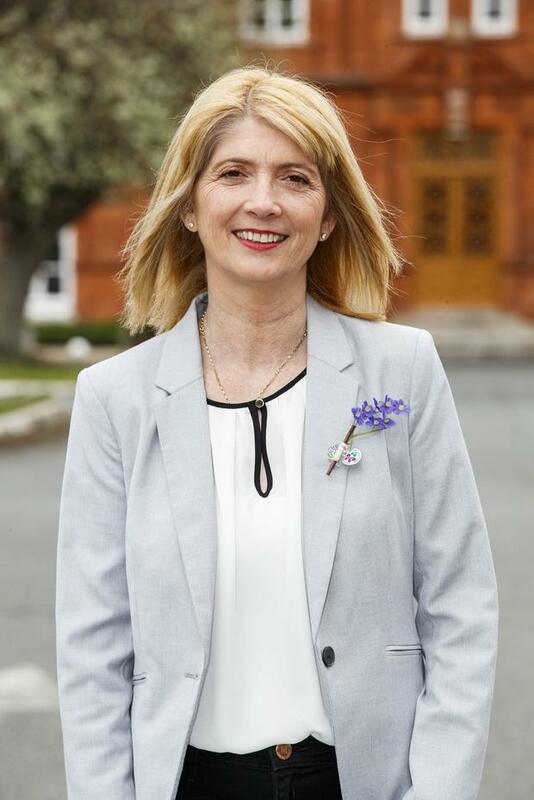 “It’s a very special day for myself and my family to be asked to help highlight Organ Donor Awareness Week alongside members of the Defence Forces and CAOGA," Yvonne said. "Pat would have been proud. We both came from military families and I grew up in the army married quarters here at McKee Barracks as my father was a Company Sergeant, while Pat, was the son of an army Corporal at Custume Barracks in Athlone. "We got married here and this place holds so many special memories. My son Cian and my daughter Jessica looked forward to coming back here today. My other daughter Rachel regretted not being able to attend. It is lovely to meet Comdt. Ciara Murray today, who served with Pat when they worked together at the Chief of Staff’s office at Infirmary Road. To demonstrate solidarity in support of Organ Donation, representatives of CAOGA in the Defence Forces – Army, Naval Service and Air Corps - stepped out at McKee Barracks along with the family of a deceased member of the Defence Forces. CAOGA organised the event in partnership with the Irish Kidney Association to mark the beginning of Organ Donor Awareness Week (30 March-6 April). Yvonne Cassidy honoured her late husband Sergeant Pat Cassidy’s wishes when he passed away at the age of 47, five years ago, by donating his organs and saving three lives. Mark Murphy, Chief Executive of the Irish Kidney Association is pictured with the deceased donor Pat Cassidy’s wife Yvonne and representing CAOGA, from the Army was Comdt. Ciara Murray, Captain Andrew Fry from the Air Corps and Lieutenant Colm Fox from the Naval Service. “Pat was seemingly very fit and healthy before he passed away at just 47 years of age. "He ran 8km a day, didn’t smoke and drank in moderation although he did have high blood pressure. Following his heart attack, he had stents inserted but he took a bad turn which is thought to have been caused by an aneurysm, which left him on life support for three days before we said goodbye to him. "We hadn’t slept for days and the decision to donate his organs was a hard one to make but was made easier knowing that we were honouring his wishes. "He had been a blood donor all his life and we had had the conversation about his wishes to be an organ donor. My children and myself are proud of Pat. At our darkest moments we take solace in knowing that he helped others through organ donation," Yvonne said. To demonstrate solidarity in support of Organ Donation, representatives of CAOGA in the Defence Forces – Army, Naval Service and Air Corps - stepped out at McKee Barracks along with the family of a deceased member of the Defence Forces. CAOGA organised the event in partnership with the Irish Kidney Association to mark the beginning of Organ Donor Awareness Week (30 March-6 April). Yvonne Cassidy honoured her late husband Sergeant Pat Cassidy’s wishes when he passed away at the age of 47, five years ago, by donating his organs and saving three lives. Pictured representing CAOGA and the Army was Comdt. Ciara Murray, Captain Andrew Fry from the Air Corps and Lieutenant Colm Fox from the Naval Service with the deceased donor Pat Cassidy’s wife Yvonne (left). Comdt. Ciara Murray said, “We are delighted to be here today in recognition of a former colleague and a gentleman Pat Cassidy and all the other deceased organ donors who have saved lives through transplantation and to be able to support the Irish Kidney Association in highlighting Organ Donor Awareness Week. "Special thanks to my fellow Defence Forces colleagues Captain Andrew Fry from the Air Corps and Lieutenant Colm Fox from the Naval Service. The Air Corps transports organ donor patients as one of its many roles. We are here to demonstrate the collective solidarity amongst Defence Forces' personnel in support of organ donation”. Chief Executive of the Irish Kidney Association Mark Murphy thanked the Defence Forces and the Cassidy family in involving members highlight the vital importance of organ donation. "It is thanks to the selflessness of deceased organ donors that there are 4,000 people in Ireland who are enjoying extended life. "We hope this initiative will motivate the public to discuss organ donation and let their family know their wishes as well as keeping the reminders present with signed organ donor cards and ticking the box for organ donation on their driving licence." The focus of Organ Donor Awareness Week which takes place from 30 March until 6 April is to remind individuals to talk to their families about their organ donation wishes and keep the reminders of their decision available by carrying the Organ Donor Card, permitting Code 115 to be included on their driver’s licence and having the ‘digital organ donor card’ APP on their smartphone.